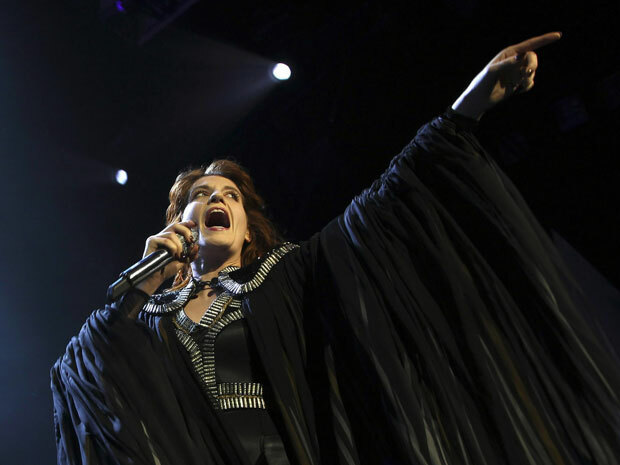 Followers of this blog know that I was rather late to the Florence + The Machine party. What can I say: between never listening to radio, not having cable and going through a “no new music” phase, I just didn’t get around to it. That is, until I saw my fellow bottle redhead belt out Aretha Franklin at a tribute. I promptly lost my mind (or found it at last?) and procured the deluxe edition of Lungs (which happened to come out right as I finally sought it out, so I consider it good timing). Florence Welch is refreshing as an artist: she’s humble, silly, and ridiculously talented, as evidenced in her live performance. Before slipping over to the Ampitheatre today, I detoured to local station Edge 102.1 and caught her two acoustic songs, and was mesmerized at the power in her voice. It’s all the more impressive when one considers that a few weeks ago, she strained her vocal cords so badly she felt them ‘pop’. The high notes are still rare and toned down, but the voice is still unmistakably emotive. Before delving further into her set, let’s quickly take a look at the openers for tonight’s show. Up first was Tashaki Miyaki, a Los Angeles-based three-piece that reminded me immediately of a dreamy, low-key version of The Like. With delicate soprano vocals that conjure up The Bird and The Bee or The Ditty Bops, they moved swiftly through a half-hour set without any real interaction with the audience at all, meaning not a single song was introduced. The only number I was able to pinpoint was a cover of The Everly Brothers’ hit tune “All I Have To Do Is Dream”, performed in ethereal, breathy fashion. While the band was solid, the trouble was this: every song sounded the same, with nothing to grab the ears. I’d be happy to see them perform again if they were on a bill for a festival or show, but I can’t say I’d actively seek them out. You may feel differently, so feel free to swing by their Bandcamp page and take a listen. Up next were The Walkmen, a band with much hype online and thus, I was keen to check them out. Marking twelve years of active music creation, the band (hailing from New York and Philadelphia) is best described as indie blues-folk rock. Vocalist Hamilton Leithauser has a gritty, whiskey-drenched voice akin to Tom Petty or Bob Dylan, although when he rocks out, you can close your eyes and imagine a Joshua Tree-era Bono. Storytelling, often meandering lyrics are laid alongside an acoustic guitar-driven sound, with lovely harmonies. Again, as with the previous opener, I found most songs sounded quite the same, with very little grabbing me lyrically; however, I add the caveat that the vocals were often muddied by guitar and drums, making it hard to pick them up, particularly given Leithauser’s lack of enunciation. Songs “Juveniles” and “The Rat” did grab my ears enough that I’ll be checking out their studio work eventually, but I can’t say I was wowed – just content. You can check their setlist out here and learn more about them at their official site. At last, we come back to the delightful Florence + The Machine. Stepping onto a stage in keeping with the ceremonial vibe – a pseudo-stained glass window effect for the backdrop and deep purples and reds for much of the lighting – the set opened with “Only If For A Night”, a track made more urgent and entreating with dramatic flourishes. The tone for the evening’s performance was set quickly: the show was, for lack of better terms, a ceremonial offering to the music gods. Welch herself alternated between poised balladeer, whirling dervish and child-like prancer as she moved through a mix of tunes from her two albums. The audience was greeted warmly, the city complimented on its women being “all tens everywhere we walked” and encouraged to “raise up” its loved ones “as a sacrifice” while Welch ran up and down the aisles, still singing hit tune “Rabbit Heart (Raise It Up)”. Colourful lighting appropriately accompanied latest single “Spectrum”, during which fans were encouraged to dance and be unique as they vied for a prize won by a young man: a personal greeting from Welch and Isa. “We may be dressed like bats, but we promise we don’t bite!” Welch remarked coyly, humbled when said young man cried after she complimented his homemade t-shirt. The humility and genuine appreciation of the sold-out crowd made the show that much better. Welch is already a pro at stage banter, chatting about her British side insisting she welcome us to the show, confessing the band feeling “tour frazzled… but once we came out here, you made us feel so much better.” Little stories behind songs were disclosed, peppering a set that veered from larger than life to subtle and seductive. Coupled with live changes to the songs that added new layers, it made for an experience well worth the ticket price. Wisely closing the main set with mega-hit “Dog Days Are Over”, Florence encouraged the crowd to join her in the “ceremony for the tour”: jumping up and down wildly. It didn’t take much prodding, as thousands obediently cheered, sang and indeed jumped after three minutes of sustained claps in time with the bridge. Unity of artist and crowd is obviously her mission and she succeeds at every turn. The result: music magic, high notes be damned (they were noticeably and understandably in short supply tonight). This is what a live show should be, but isn’t always. Music should move you, thrill you and ultimately touch your heart. The ability to connect with a live performance is what drives me to hundreds of shows. If nothing else, rising artists should take in Florence + The Machine as a primer on how to perform as opposed to simply playing. There’s a vast difference. If I have to tell you how to find Florence + The Machine online, I have to shake my head at you. Here you go.